The 40,000 Years mural on Lawson Street is a vital part of Redfern’s cultural heritage. It contains a complex weave of Aboriginal histories that relate both to the Redfern area and to the passage of Aboriginal people to and from the city of Sydney from across Australia. Many of the mural’s images are of community leaders such as Mum Shirl, who embody the interconnections between family, politics, history and resilience in the Redfern community. The mural has deteriorated considerably since it was painted in 1983. There is widespread agreement that it needs to be restored. Discussions about its future, initiated by the Redfern Station Community Group, have involved the Aboriginal Health Service, Aboriginal Housing Company, Metropolitan Local Aboriginal Land Council and Eora TAFE. At the same time, the upcoming Central to Eveleigh Urban Transformation Program has highlighted the need for other murals that represent contemporary Indigenous stories to be central to Redfern’s revitalisation. The Redfern Station Community Group has been in conversation with Sydney Trains and RailCorp (who owns the wall upon which the mural is painted) and Urban Growth to explore these ideas. The Redfern Mural Gathering on 13 November 2015 is a collaboration between the Metropolitan Local Aboriginal Land Council, the Redfern Station Community Group, Eora Tafe and artists and researchers from Sydney College of the Arts (SCA), University of Sydney. It is being facilitated by members of the Space, Place and Country research group at SCA who have worked with writers, artists and cultural leaders to explore what Country means within an urban context. The Mural Gathering will provide an opportunity for invited speakers, the local community and artists to discuss the mural’s cultural significance and its planned restoration, as well as share ideas about the histories and stories that could be represented in future public art projects in Redfern. The purpose of the open session is to create an opportunity for the community to discuss their relationship with the mural and their views on its restoration. 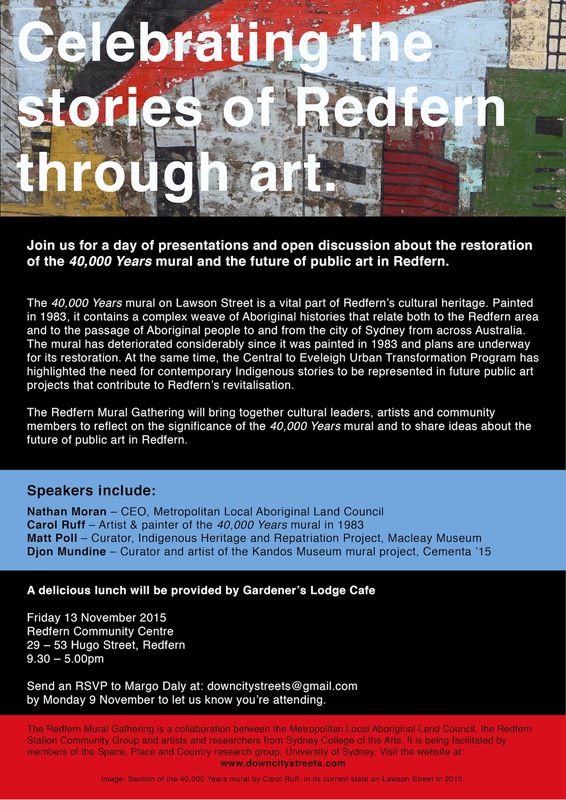 This discussion may also explore ideas for future murals and public art projects in Redfern. In February 2013, Redfern Station Community Group was formed from the need to make a compelling case for an elevator at Redfern Train Station, but its focus evolved to improving the gardens in and around the station and extended to public art. Partnerships have been formed over time as the proposed mural restoration has moved through stages in development. The ongoing dialogue has included community members, NSW Police, RailCorp, Sydney Trains, Carriageworks, City of Sydney, Counterpoint Community Centre and the Metropolitan Local Aboriginal Land Council, among others. In late 2013 Sydney Trains requested that the group take action to restore the two murals on Lawson Street, 40,000 Years and Say Know to Drugs. After extensive community consultation, NSW Users and Aids Association (NUAA), who had commissioned the Say Know mural in 1998, were handed control of the restoration in late 2013. After undertaking research to find and engage the 40,000 Years mural creators, Carol Ruff and community artists responsible for the mural were engaged. Informed by the community, the group applied for and was successful in winning a City of Sydney matching grant for $11,000, in order to restore the 40,000 Years mural. The Redfern Station Community Group considers the Redfern Mural Gathering as the next stage of community consultation. Brief background on Space, Place and Country (SPC) research group, Sydney College of the Arts, University of Sydney. In February 2015, under the project named Down City Streets, the Space, Place and Country research group ran a cultural walk of Redfern led by Nathan Moran, CEO of Metropolitan Local Aboriginal Lands Council (MLALC). The event concluded with a discussion based on responses from participants to the walk. One of the main outcomes of the discussion was to explore the possibility of restoring the 40,000 Years mural. Subsequently, in 2015 SPC also ran a series of workshops led by community leader, writer and broadcaster Cathy Craigie and architect Kevin O’Brien. In addition to these activities, over 2014 to 2015, SPC have been engaged in dialogues with MLALC, Eora TAFE and local Aboriginal arts practitioners.